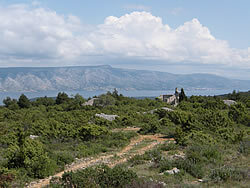 Hvar is a karst landscape, made out of limestone like the rest of the coastal range from the Dolomites down to Greece. That means surface water is rare, because it dissolves minerals in the rock and finds its way underground, making caves and underground streams. On the island here, there are caves up in the mountains where remains have been found of ancient islanders before the Greek settlers arrived. Underground streams presumably feed the freshwater springs around the island. In the same way, a house built of limestone is not quite as solid as it appears. 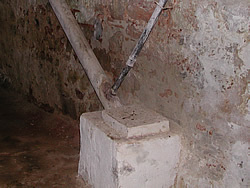 The part of the house most susceptible to water penetration, is the stone itself! That’s unlike the sandstone houses of northern Europe, where you’d expect dodgy pointing to be the source of any leaks. So in Dalmatia, stone houses would be rendered on their most exposed sides, where strong winds could drive the water deep into any cracks. Our house was like that. The east and south walls were rendered – covered in a layer of protective plaster. We took the modern option of spraying with a clear waterproof treatment that gets absorbed into the stone. Let’s hope it works! The old houses have another quirky feature, and this gets down to the real basics of life. When looking around our house for the first time, we were struck by the arrangement of pipes in the konoba disappearing into the floor. That, we were told, is the fuž (rhymes with the French word “rouge“). Somewhere under the property is a crack in the rock, sort of a natural septic tank, if you like. Exactly where it is, and how deep, who knew? They offered to pour water down to find out. Lovely. Town sewage was only just arriving in Vrboska, so that wasn’t an option for the previous 400 years. There are “green” apartment blocks in Germany that process their own waste water via a series of natural gravel filter beds. I guess our fuž is similar to that. And as it happens, we now know exactly where our crack in the rock lies. On the day renovations started, the bulldozer fell into the hole! It’s now properly piped in, safely reinforced and has a handy access hatch. The fuž that is, not the bulldozer – that’s gone. Though it would have made an interesting feature in the courtyard!